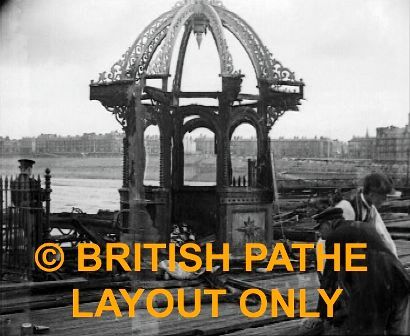 Lytham & St.Annes on the Sea Lancashire - Local History - Blackpool North Pier Fire, Pathe News, 1921. Blackpool North Pier Fire, Pathe News, 1921. "£40,000 Damage caused by disastrous fire which destroyed North Pier Pavilion. Blackpool, Lancashire". Produced by Pathe News, 1921. People walking along the prom as the camera pans over the pier. People watching as firemen spray the wreckage. Camera pans across the burnt supports, and we see bits of the structure in the sea. Long shot of people underneath gathering pieces of the wood.